In action against an enemy of the United States. The Silver Star differs from the service crosses in that it requires a lesser degree of gallantry and need not be earned while in a position of great responsibility. Air Force pilots, combat systems officers, Navy and Marine Corps Naval Aviators and Naval Flight Officers flying fighter aircraft are often considered eligible to receive a Silver Star upon becoming an ace (i.e., having five or more confirmed aerial kills), which entails the pilot and, in multi-seat fighters, the weapons system officer or radar intercept officer, intentionally and successfully risking his life multiple times under combat conditions and emerging victorious. However, during the Vietnam War, the last conflict to produce U.S. fighter aces, the one USAF pilot, the two USAF navigators/weapon systems officers (who were later retrained as USAF pilots), the one USN Naval Aviator and the one USN Naval Flight Officer/radar intercept officer to achieve this distinction were eventually awarded the Air Force Cross and Navy Cross, respectively, in addition to Silver Stars previously awarded for earlier aerial kills. Soldiers who received a Citation Star for gallantry in action during World War I were eligible to apply to have the citation converted to the Silver Star (see “History” below). In the U.S. Army, the Valorous Unit Award is considered the unit level equivalent of a Silver Star. The Silver Star is the successor decoration to the Citation Star which was established by an Act of Congress on July 9, 1918. On July 19, 1932, the Secretary of War approved the Silver Star to replace the Citation Star. 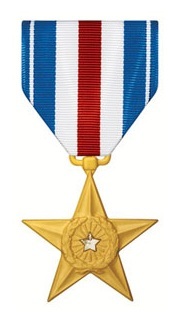 The original Citation Star is incorporated into the center of the Silver Star, and the ribbon for the Silver Star is based closely on the Certificate of Merit Medal. Authorization for the Silver Star was placed into law by an Act of Congress for the U.S. Navy on August 7, 1942 and an Act of Congress for the U.S. Army on December 15, 1942. The current statutory authorization for the Silver Star is Title 10 of the United States Code (10 U.S.C. § 3746). The Department of Defense does not keep extensive records of Silver Star awards. Independent groups estimate that between 100,000 and 150,000 Silver Stars have been awarded since the award was established. Colonel David Hackworth is likely the record holder for most Silver Stars awarded to a single person. He earned ten Silver Stars for service in the Korean War and the Vietnam War, in addition to two Distinguished Service Crosses. A group of silver stars being awarded to the 3rd Special Forces Group. The other medal in the upper left corner is a Purple Heart. The Silver Star is a gold five-pointed star, 11⁄2 inches (38 mm) in circumscribing diameter with a laurel wreath encircling rays from the center and a 3⁄16 inches (4.8 mm) diameter silver star superimposed in the center. The pendant is suspended from a rectangular shaped metal loop with rounded corners. The reverse has the inscription “FOR GALLANTRY IN ACTION”. The ribbon is 13⁄8 inches (35 mm) wide and consists of the following stripes: 7⁄32 inches (5.6 mm) Old Glory red (center stripe); proceeding outward in pairs 7⁄32 inches (5.6 mm) white; 7⁄32 inches (5.6 mm) ultramarine blue; 3⁄64 inches (1.2 mm) white; and 3⁄32 inches (2.4 mm) ultramarine blue. Second and subsequent awards of the Silver Star are denoted by oak leaf clusters in the Army and Air Force; and by 5/16 inch stars in the Navy, Marine Corps, and Coast Guard. Is there a list of Silver Star recipients for Charlie Company? Good question. I am unaware of a list for Charlie Company. We have several Silver Star recipients.